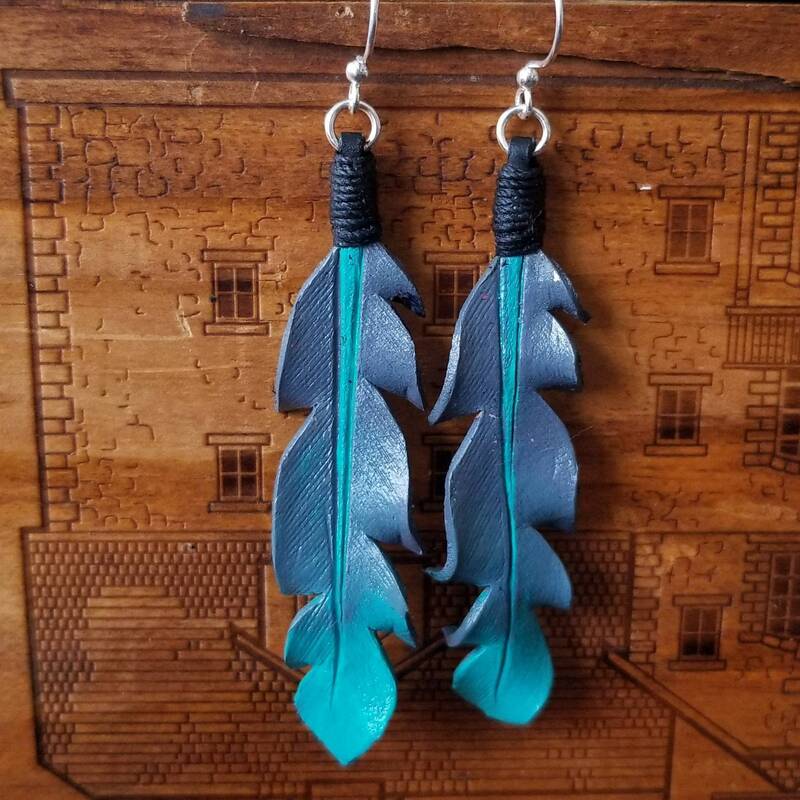 A pretty evening sky color combination are the inspiration for these gorgeous leather feather earrings. Crafted from leather, the feathers are hand-cut and tooled before being wet formed to create their beautiful shape. After drying the leather has been hand-painted in beautiful shades of grey and turquoise. 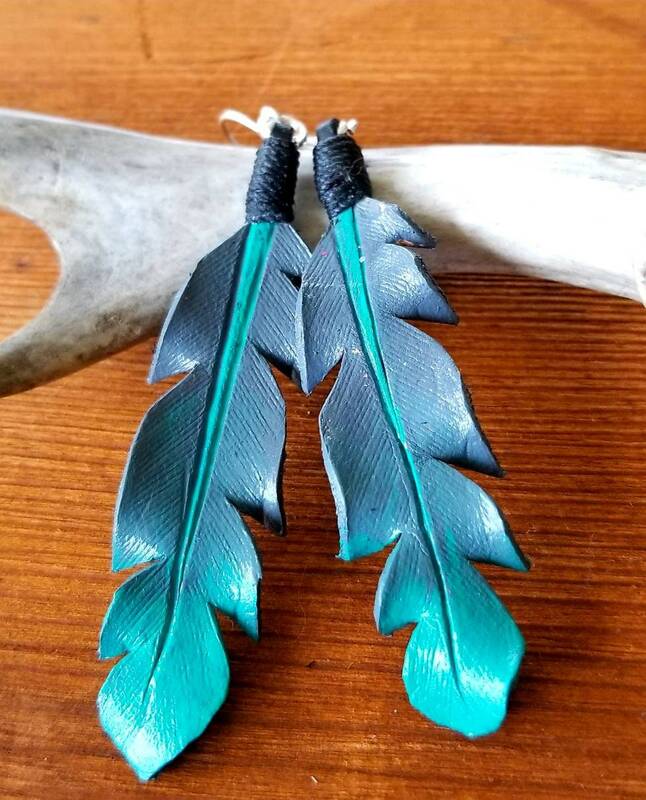 These 2.50 inch long earrings hang from nickel free silver earring wires. Be sure to visit The Bucking Mare on Instagram, Facebook, Pinterest, and Twitter. Copyright 2014-19 The Bucking Mare. All rights to reproduction reserved by designer. All product descriptions, images, and product design are property of designer/store owner and may not be used in any manner without express written consent of designer/store owner. I accept credit cards, PayPal, checks and money orders. If paying by check or money order, please make payment within 7 days. Shipments paid by check will be shipped when the check has cleared. A $25 returned check fee will be charged on all returned checks. For items available for immediate shipment, payment is due upon purchase completion. For personalized customs orders, i.e. names, initials, unusual sizes, payment is due upon completion of the work and prior to shipping. All orders placed in Washington state will be charged state sales tax (7.7%). ** Shipping is always FREE here at The Bucking Mare! ** All shipments will be sent via USPS first class or priority mail. Any shipment valued at or above $50.00 will be insured. All shipments will include delivery confirmation. *For items available immediately for shipping please allow 2 days for processing. *Custom orders will require additional time. Please contact us for the estimated time frame it will take for your order to be completed. *Due to my remote location, during the winter months, there is a chance that weather will affect your order's processing, shipping and delivery times. Sometimes you just can't fight with Mother Nature! In case of a delay, we will do our very best to keep you updated regarding your order's status. I want to ensure that you are completely satisfied with your purchase. If you should have any problems or issues with your item please contact us immediately. We will gladly work with you to resolve the problem. I take great pride in the quality of our craftsmanship and your satisfaction is my primary focus. 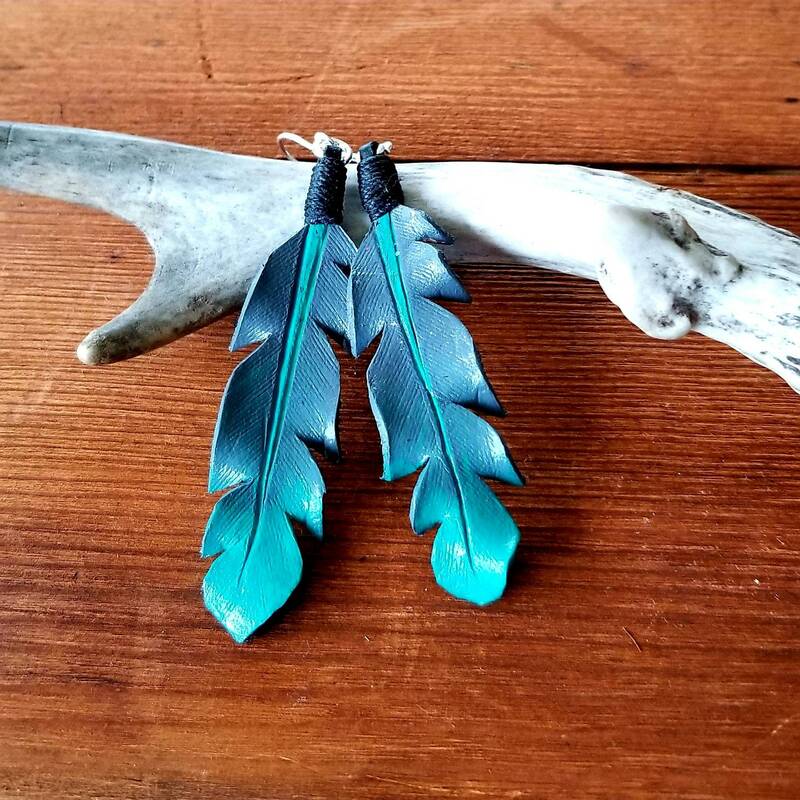 I welcome custom orders so if you see something that you see but would like made a little differently. I would be happy to work with you and see if I can't design something that is uniquely you! If you would like to speak to me regarding a custom order, please call us at 509-775-2070 or 619-306-1123. You can also contact me via our email address (buckingmare@gmail.com) or on Facebook (The Bucking Mare). Copyright for all original designs and images are the sole property of the Etsy store owner/designer. Duplication or unauthorized use is not permitted under any circumstances, unless by expressed written consent of Etsy store owner/designer.